Wilfredo Benitez of Puerto Rico was the youngest professional world champion when he won the Jr. welterweight title in 1976 at the age of 17 years and 173 days. The first world title fight under the Queensbury rules took place in New York on July 30, 1884 when middleweights Jack Dempsey of Ireland and American George Fulljames went at it. At seven feet tall and 328 lbs., Russian Nikolai Valuev is the tallest and heaviest boxer to ever hold a professional world title. Boxing is also called pugilism. There are two forms of boxing - amateur and professional. Boxing was not part of the 1912 Summer Olympics in Stockholm, because Swedish law banned the sport at the time. The 2008 Summer Olympics was the final games with boxing as a male only event. It has been a Commonwealth Games sport since the inaugural edition of the event's precursor, the 1930 British Empire Games. On Oct. 7th, 2006 Russian Nikolai Valuev (328 lbs.) outweighed his American opponent Monte Barret (222) by 106 lbs. This is the biggest weight advantage ever in modern day boxing. Valuev TKO’d Barret in the 11thround. Archie Moore had the most knockouts in pro boxing with 145. The longest reigning pro heavyweight champion was Joe Louis at 11 years and seven months. American Rocky Marciano, at 49-0, with 43 KO’s was the only undefeated heavyweight champion in pro boxing history. Marciano died in a plane crash at the age of 45. In the 1890s, Charles "Kid" McCoy used to trick his opponents into thinking he was ill or in trouble in the ring. Opponents weren’t sure if he was actually hurt or just faking it. This is how the expression "the real McCoy" was born. French boxer Georges Carpentier reportedly started his career at the age of 14 as a flyweight and ended up as 32-year-old heavyweight. He fought in every weight class pro boxing had from 1908 to 1926. Former pro heavyweight champion Max Baer was the father of Max Baer Jr., who played country bumpkin Jethro Bodine on the 60’s hit TV show The Beverly Hillbillies. Actor and talk show host Tony Danza had a brief but successful pro boxing career as a middleweight from 1976 to 1979 with a record of 9-3, with 9 KO’s. Hollywood actor Mickey Rourke went 6-0-2, with 5 KO’s between 1991-1994. Former heavyweight champions Bob Fitzsimmons and Jack Johnson were both 50 when they fought their last pro fights. Sam Langford and Harry Wills fought each other as professionals 17 times. The first boxing club was formed in London, England in 1814. It was called the Pugilistic Club. The first boxing stadium, Figgs Amphitheatre, was built in London, England in 1917. The first pro fight broadcast over the radio was Jack Dempsey vs. Jess Willard in 1919. The first televised fight was between Benny Leonard and Mickey Walker in 1931. Heavyweights Sonny Liston and Floyd Patterson earned the first million dollar paydays when Liston KO’d Patterson in 1963. Bob Fitzsimmons was the first pro fighter to win world titles in three different weight divisions: middleweight (1891), heavyweight (1897), light heavyweight (1903). Michael Spinks was the first light heavyweight to win the heavyweight title as he defeated Larry Holmes in 1985. All time boxing great Muhammad Ali was once asked by a flight attendant to fasten his seat belt. Ali replied, "Superman don’t need no seat belt." The witty attendant answered back, "Superman don’t need no airplane!" The first mouth piece was used in 1915 in a pro bout between Ted "Kid" Lewis and Jack Britton. Former pro boxer Victor McLaglen went on to win an Academy Award for his role in the movie "The Informer." In 1926 every world champion was American. The longest bare-knuckle fight was six hours and 15 minutes long, as James Kelly and Jonathan Smith battled it out in 1855. The most recorded bare-knuckle rounds numbered 276 (four hours and 30 minutes in 1825). A round ended when one boxer was knocked down. The 1956 heavyweight Olympic boxing champion Pete Rademacher fought for the world title in his very first pro bout and was KO’d by Floyd Patterson. Thomas Hearns won championships in five different weight classes. These were welterweight, Jr. middleweight, super middleweight, light heavyweight and cruiserweight. Hearns fought for a sixth title but was beaten by middleweight champ Marvin Hagler in a now-classic bout. 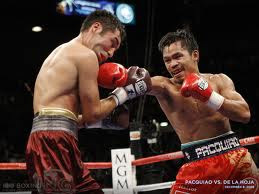 The result is decided when an opponent is deemed incapable to continue match by a referee or if an opponent is disqualified for breaking a rule, resigning by throwing in a towel, or by judges' scorecards at the end of the bout. Onomastos Smyrnaios is the first winner in Olympic boxing of ancient Greek. In Ancient Greek culture, the god, Apollo, was regarded as the inventor and guardian of the sport of boxing. The most prolific boxer in history was Great Britain's Len Wickwar who, between 1928 and 1947, fought 463 bouts. He also holds the records for the most wins (336) and most losses (127) of any boxer. Archie Moore holds the record for most knockouts during a career -- a staggering 141. Boxing Day, a holiday celebrated on the day after Christmas in former British Commonwealth nations (e.g. Australia, Canada and South Africa), has nothing whatsoever to do with the sport of boxing. It is a day when the churches open their poor boxes for donations that day. The youngest boxer to win a title is Wilfred Benitez at 17. The most heavyweight title defenses is 25 by Joe Louis. The record for most first round KO's is held by Wilfred Benitez.